Alexa (which works with other devices) – provides you quick access to the information and entertainment that you want. Ask questions, and play music. Check your calendar, news, weather and more. Durable & tumble proof. Claims to be 2X more durable than the latest iPad mini & cost a lot less. Watch millions of movies, TV shows, music songs, kindle books, games, and app. Comes pre-loaded with Facebook, HBO, Netflix, Spotify, to name a few. Read – books starting out as low as $2.99, you can find millions of titles. Join Amazon Prime, for unlimited reading on your Kindle, for only $9.99 a month! Turn on Blue Shade for nighttime reading. Blue Shade optimizes the backlight for comfortable reading at night. Blue Shade is an exclusive Fire OS feature. Listen -Enjoy the millions of songs by thousands of artists, sold in the Amazon Digital Music Store. What music you buy is automatically saved to your Music Library, which you can download or play at any time. You can also get unlimited music with Amazon Music Unlimited, the cost is $7.99 a month, for Prime members or $9.99 a month, for non-members. You can also listen to books on Audible. Watch – stream Movies, TV shows on Amazon Video, Hulu Plus, Netflix, Sling TV, NOW and more. With Prime Membership you can watch downloaded videos from anywhere!! In the car, on vacation, at your friend’s house, on a plane. Wherever you don’t have a WiFi connection. You can add cable prime channels to your subscription with Amazon Prime, for a fee. Play – over 600,000 games. Access all of your social media!! Watch all your favorite YouTube, Vine, Buzz and more videos you want. This is the best tablet, by far, that I’ve owned–to date. This tablet is not just for reading! We added Showtime for $8.99 a month. Which you can cancel at any time, with no penalty. We add it to watch The Big Bang Theory, Survivor, and Shameless, and when the current season is over, we unsubscribe to Showtime! We stream it on our TV, but I have access to it on my Kindle. At the time I purchased mine, it was cheaper to buy it with ads. All ads are for the entire Amazon store. It shows the daily deals, as well as specials they have going on. Sometimes only available for Kindle Fire owners. I can pay $15 to remove the ads, that is optional. Often there are specials for free books. Signing up for your favorite authors is pretty cool. You’ll get emails of authors upcoming new books, that can usually be purchased before it goes public. Join Goodreads and Twitter, there are often specials through those as well. I love the Kindle Unlimited, for I am an avid reader. You can purchase books individually, or if it is a book in a series, you can get the option to buy the entire set of books, and most of the time it is at a better price. I don’t watch many movies or TV on it, but that is because I’ll use my laptop to watch, for it has a 17″ inch screen. But I do play a lot of games as well as keep up on all my social media. (Facebook, Twitter, Pinterest, and Google+. 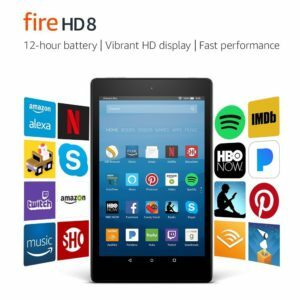 I previously owned the Kindle Fire 7. And although the Kindle Fire 8 is way better, it is a tad bit heavier than the Kindle Fire 7. I shop from my Kindle Fire 8. Browse the internet. The only thing I found that I can not do is download games from the Google Play Store. I’ve been told there is a workaround for that. But doing this workaround voids your Kindle warranty. I’d rather keep the warranty than accessing the Google Play Store. I have my smartphone for that. I make out with the Kindle Unlimited Reading, cause it’s only $7.99 (I’m Prime), and I would pay that much, if not more for a new release. Charge time is fairly decent. As well as the battery. There have been times where I’ve fallen asleep reading, and by morning I’ve lost 2%, maybe 3% of my battery. If I come across a word I do not know the mean off, I put my finger on it, highlights it, and then a small dictionary page will pop up giving me the meaning of the word. And I have the option to click on to view ways in which this word is used. I use that a lot. Can take it anywhere, even the beach, With its slim design, I can slip/fit it in anywhere. Kindle Unlimited reading (paid membership) Pays for itself if you read often. There are so many titles, I’ve always found whatever book it is I’m looking for. Even books that are 25 years old!! The screen resolution is fantastic. Very responsive. It’s is a bit heavier than my Kindle Fire 7. Unable to download from other stores. Although I don’t use the audio often, it’s rather tinny. Probably why I don’t use it much. I definitely enjoy using my Kindle Fire. I owned a Samsung years ago and my Kindle Fire has it beat, hands down!! I use it mostly for reading, social media, shopping, and surfing the internet. I occasionally will play my games on it. Would I recommend, yes!! You can not beat the price–anywhere!!!!! I gave it an 8 out of 10 rating due to the 3 cons that I listed above.